Science, you could say, comes in two sorts. There’s the stuff we more or less understand – and there’s the rest. We’re pretty secure with the earth being round and orbiting the sun, the heart being a pump connected to a network of tubes that keeps us alive, DNA carrying the genetic code – and a few other things. But human beings are curious souls and we tend to be fascinated by what we don’t know and can’t see – why the Dance of the Seven Veils caught on, I guess. Scientists are, of course, the extreme example – they spend their lives pursuing the unknown (and, as Fred Hoyle gloomily remarked, they’re always wrong and yet they always go on). But in this media era they pay a public price for their doggedness because they get asked the pressing questions of the moment. Is global warning going to finish us off soon, why is British sport generally so poor and – today’s teaser – does being fat make you more likely to get cancer? The major cancers have become familiar because the numbers afflicted are so staggering – but the one good thing is that the epidemiology can tell us something about the disease. Thus for cancers of the bowel, endometrium, kidney, oesophagus and pancreas and also for postmenopausal breast cancer there is clear evidence that being overweight or obese makes you more susceptible. In other words, if you compare large groups with those cancers to equally large numbers without, the disease groups contain significantly more people who are fat. We should add that the above list is conservative. A number of other cancers are almost certainly more common in those who are overweight (brain, thyroid, liver, ovary, prostate and stomach tumours as well as multiple myeloma, leukaemia, non-Hodgkin lymphoma and malignant melanoma in men). The usual measure is Body Mass Index (BMI) – your weight (in kilograms) divided by the square of your height (in metres). A BMI of 25 to 29.9 and you’re overweight; over 30 is obese. In England in 2009 just over 61% of adults and 28% of children (aged 2-10) were overweight or obese and of these, 23% of adults and 14% of children were obese. And every year these figures get bigger. Impossible to say exactly – for one thing we don’t know how long you need to be exposed to the risk (i.e. being overweight) for cancer to develop but in 2010 just over 5% of the total of new cancer cases in the UK was due to excess weight. That’s another conservative estimate, but it means at least 17,000 out of 309,000 cases, with bowel and breast cancers being the major sites. Showing an association is a good start but the important thing is to find out which molecules make that link. For obesity and cancer detail remains obscure but broad outlines are emerging, summarised in the sketch. In obesity fat (adipose) cells increase in both number and size (so it’s a double problem: more cells – and the fat cells themselves are fatter). As this happens other cells are recruited to adipose tissue and, from this cellular cooperative, signalling proteins are released that have the potential to drive tumours. This picture is similar to that of the microenvironment of tumours themselves, where many types of cell infiltrate the new growth. Initially this inflammatory and immune response aims to kill the tumour but if it fails the balance of signalling shifts so that it actually helps the tumour grow. 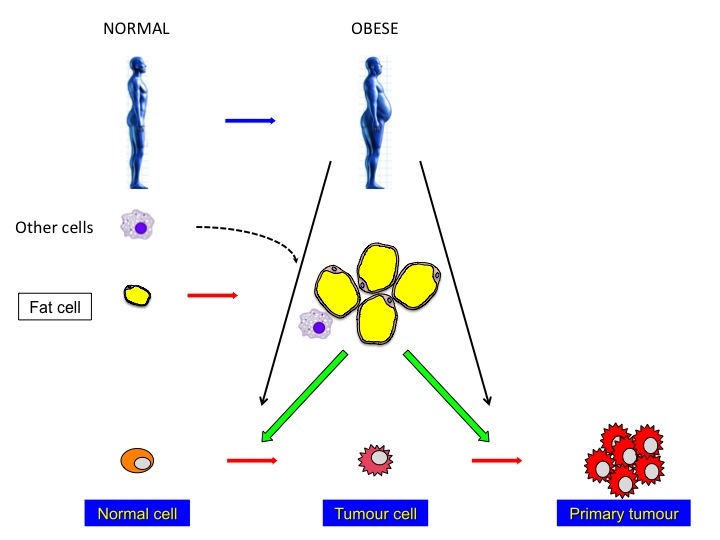 In addition to signals from fat cells themselves, obesity is usually associated with increased levels of circulating growth hormones (e.g., insulin) and of lipids, both of which may also promote tumour development. 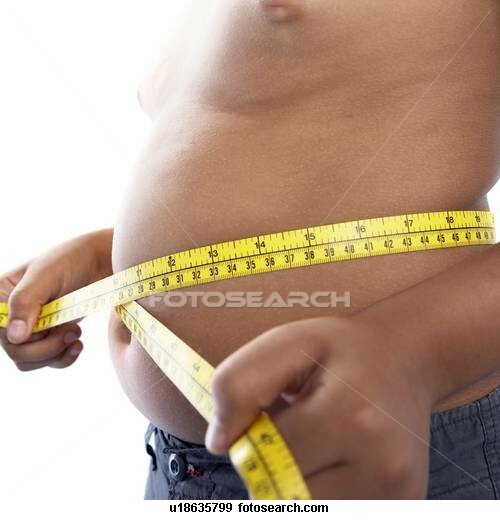 Thus many signals with cancerous potential arise in obese individuals. In principle these could initiate tumour growth or they could accelerate it in cancers that have started to develop independently of obesity. So it is complicated – but at least as new signalling strands emerge they offer new targets for drug therapy. World Cancer Research Fund (WCRF) Panel on Food, Nutrition, Physical Activity, and the Prevention of Cancer (WCRF, 2007). ‘Where do cancers come from?’ One of those dreaded childish questions – so best to get your thinking in first, rather than trying to answer on the hoof in the face of that unblinking stare of expectation. In the beginning, as you might say, we need a hand-wavy word on how DNA ‘makes proteins’, why they’re important (‘Proteins R Us’, in short) and what can go wrong with them. In 1953 Watson and Crick worked out the structure of DNA. It holds, of course, the secret of life and you might observe that it has the appropriate shape of a spiral staircase to nowhere. The ‘genetic code’ is the order of thousands of small bits that are linked together to make the very long molecules of DNA. These bits contain smaller bits called bases – four of them (A, C, G and T) – and they’re firmly stuck together so that each DNA molecule is pretty stable. 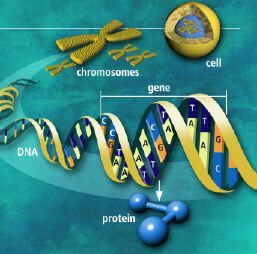 In addition, bases in one DNA can stick to those in a second strand – hence the double-helix. The essence of life is the transformation of the genetic code into the corresponding sequence of the building blocks that make proteins. The blocks are amino acids, stitched together to make proteins in much the same way as DNA is built from its base-containing units. There are 20 different types that can be glued together in any order, a typical protein containing a thousand amino acids. They tell the protein how to fold up into its final shape – a 3D structure unique for each protein. Many proteins are blobs (like balls of string) but, as you’d guess given that they do everything, they come in all shapes and sizes—cables, sheets, coils, bridges, etc. The idea then is fairly simple: flexible protein chains fold themselves into their working shape – and individual shapes enable proteins to do specific jobs. A simple sum can show that a limitless variety of proteins can be made: they are the machines of life that make all living things work and they have created all the species of life on earth. Proteins make life possible because the exquisite choreography that generates their shape creates localised regions (sticky bits, clefts, cavities, etc.) for interactions with other molecules. These confer amazing versatility: proteins can ‘talk’ to each other and form relay teams that transmit information from one part of a cell to another, they can generate movement (as in muscles), and bring molecules together (e.g., when they act as enzymes driving chemical reactions that otherwise would not occur). But, as we all know, mistakes can happen even in the best-run enterprises. Mistakes in proteins arise from mutations – changes in the DNA code. Many diseases result from single base alterations: if that changes an amino acid the result can be a protein with dramatically altered function. A well-known example is cystic fibrosis: a protein made in the lung has one abnormal amino acid: the effect on its activity causes a build-up of mucus that makes breathing difficult and is a target for fatal infections. Cancers are also caused by mutations but they’re a bit more complicated, being driven by groups of mutations, rather than by one event. For most cancers these are picked up as we go through life – so the creation of a cancer is a slow process. Most don’t appear until we are over 60 years of age – collecting a suitable hand of mutations takes time. Because several critical mutations are required you’d guess that what tumour cells are up to is evolving a number of tactics for outsmarting their normal counterparts on the survival front. Indeed they are. They multiply in an unregulated way (because they ignore signals that control normal cells), side-step protective mechanisms that usually kill abnormal cells, divert nutrients from normal tissue to themselves, and make new blood vessels for the delivery of food and oxygen. Perhaps most amazingly of all, they seduce and subvert cells of the immune system: these begin by trying to eliminate the tumour but end up playing a key role in its growth – a sort of co-operative corruption. All this is why cancer needs several mutations, and these are part of a wider genetic mayhem that will kill most cells – because essential survival genes are damaged. The cells that emerge as tumour precursors are molecular freaks in that they’ve both survived and picked up a bag of dirty tricks with which to out-compete their normal brethren. So, molecularly speaking, cancers are rare events. What’s more, there’s no forethought, no premeditation at work here. If the expression ‘unintelligent design’ conveys random chance in a game of genetic roulette then it’s an excellent descriptor of cancer evolution. If all this is beginning to sound familiar, so it should. It’s a completely undirected process that usually fails – but when it succeeds represents an extraordinary triumph of the flexibility of DNA and hence the adaptability of cells. 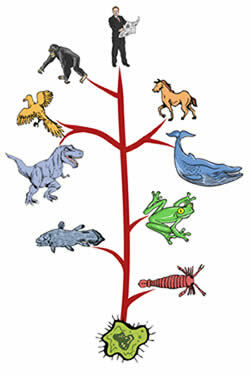 Familiar, of course, because it’s a form of evolution that parallels the emergence of new species. In the revolution started by unveiling the structure of DNA, the biggest advance has been finding a way to work out the order of bases – the genetic code. The first complete human DNA sequence came in 2003. Since then astonishing technical advances have led to thousands of tumours and hundreds of different species being sequenced. From this you can estimate when new species arose and draw a map of the evolution of all major forms of life on earth from a single, common ancestor. The time scale is incomprehensibly vast, but the picture is stunning in its simplicity, showing how everything is related – bugs, plants, fungi and humans – and how that family has emerged over nearly four billion years. This would have delighted Charles Darwin who, in 1859, was able to define evolution by natural selection only on the basis of what he could see. Molecular biology has now revealed its foundations. In many ways tumours do indeed behave like new species: through the acquisition of mutations they out-compete normal neighbours and establish new niches in which to survive and prosper. But tumours are not new organisms: they’re normal cells that have gone off the rails – been hijacked, if you will, by delinquent genes. The big difference is the brief time scale over which tumours develop compared with the almost infinitely slow, step-wise testing of novel genetic variants in species evolution. So becoming a tumour is a very chancy business – but it’s a lot less fraught than making a new form of life. They take any short-term growth advantage conferred by a mutation without concern for the consequences. When a cell picks up its first growth-promoting mutation it has taken an irreversible step towards a life of crime. It’s become a high roller in the cellular casino, addicted to roulette of the Russian variety, and no amount of genetic counselling will reform it. If only it could think, how our tumour cell would long for a guiding hand – a more knowing form of life that could steer its orgies of DNA destruction toward survival. Alas! Like every other life form, tumours are in thrall to the random creator called chemistry. In a tiny few the dice fall favourably and they grow to rule their kingdom – briefly. Oh for an intelligent brain to design them not to kill their life-support system! Like cellular spaceships seeking immortality in the celestial wastes without the know-how to reach escape velocity, they can only burn brightly before crashing. Tumours are indeed a microcosm of evolution, working on an abbreviated time-scale – they’re dynamic Darwinism.